Pitti Immagine Uomo is a trade show for textiles, exhibitions, and fashion events--all of which will have major influences on what fabrics, styles, and approaches will be used in the near future collections for most fashion houses within the seasons ahead. Pitti, alluding to the Pitti Palaces where the powerful Medici family used to reside in Florence, Immagine, which stands for image in Italian, and of course Uomo, meaning man--opened this year's 79th edition (this past Tuesday) with a woman designer to kick off 2011's fashion fair: Alberta Ferretti. 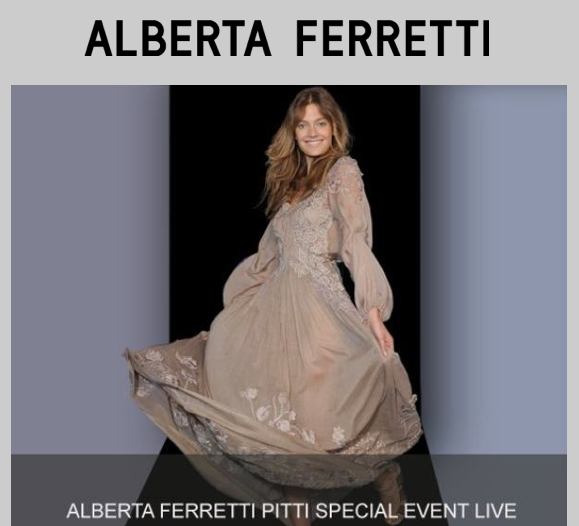 Below is the press release by Ferretti herself--on what it means as a woman to open for what used to be an exclusive-all-men's-affair, as well as a clip of the show that took place at the Church of Santo Stefano di Ponte, (which was live streamed on 17 websites globally--as part of the ever growing new media convergence), as well as some footage from the event. « I enthusiastically accepted the invitation to show in Florence during the Pitti Immagine Uomo, the world renowned Men's show, with the objective of creating a unique and sincere collection. This is an important occasion, not necessarily to showcase myself as a designer, but more importantly to unite my voice as a designer with women everywhere who work to provide new opportunities for women everywhere. This is also why I wanted to partner with the Jordan River Foundation, an Association sponsored by Her Majesty Queen Rania of Jordan who represents a cultural link between East and West, in the name of women's emancipation and independence.» -- Alberta Ferretti. The dresses will be shown by women among which there are top models, socialites, researchers, lawyers, actresses and sportive women connected to important humanitarian causes. Among these there are Zani Gugelmann Amanda Hearst,Eva Riccobono, Matilde Borromeo, , Martina Colombari, Camilla Belle, Nicole Grimaudo, Carmen Dell'Orefice, Marisa Berenson, Georgie Henley, Tamsin Egerton, Talulah Riley, Olivia Inge, Marpessa, Darya Spirovadova, Nieves Alvarez, Nathalie Moelhaussen, Sarah Felberbaum, Alessia Piovan, Katy Saunders, Virginia Valsecchi, Chiara Ferragni, Valentina Gambino e Costanza Honorati.